The River Café: located on the Rio Cuale Island in the heart of Puerto Vallarta, it’s a wonderful spot for romance with white linens, a live jazz trio and a private table on a gazebo perched out over the river. Trio: lushly landscaped, this Mediterranean fine dining restaurant feels more like a hidden jewel in Tuscany. 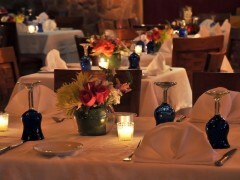 Excellent service and consistently delicious food make Trio a favorite in Puerto Vallarta. Hacienda San Angel: a beautiful Mexican hacienda in the center of Vallarta’s Gringo Gulch with stunning bay views, live Mariachi and a very romantic ambiance. Ginger Garden Lounge: located in the 3.14 Plaza in Nuevo Vallarta, couples can enjoy innovative Asian fusion cuisine in a private cabana. For more recommendations for romantic rendezvous, contact your Luxury Beach concierge.